Today: A Venetian dish as tasty as it is stunning. 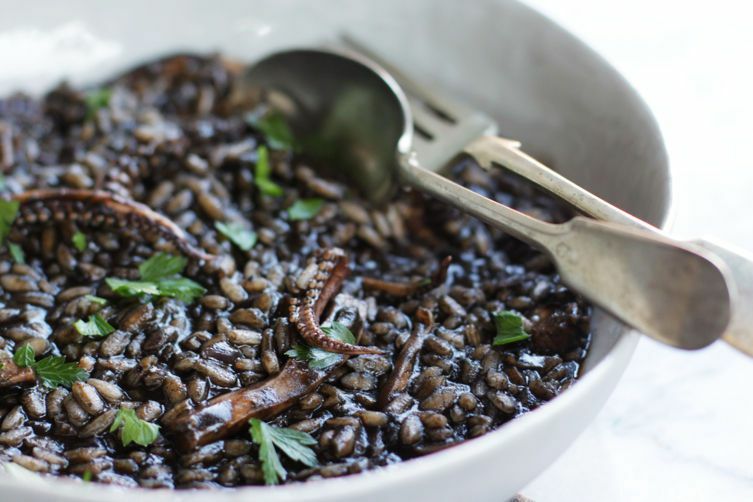 Risotto al nero di seppia -- squid ink risotto -- is one of the most Venetian dishes around. 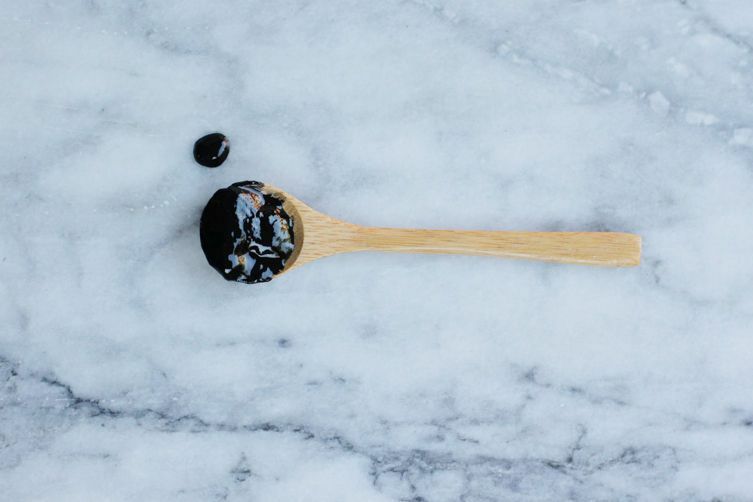 The glossy, black ink lends a briny, even earthy flavor to this dish -- but above all, it gives it that characteristic deep, dark color that inevitably leaves an impression on those not used to eating it. While it may seem like an expensive or superflous ingredient to some now, this is a dish that actually characterizes the poor peasant cuisine of this region. Many remember this dish as symbol of tougher times, when the only thing available to flavor the rice was the cheap, leftover ink, after all the squid was eaten. In Venice (and pretty much anywhere on the Italian coast), squid can still be found with their ink sacs attached, especially at the fish markets or good fish mongers. Piles of white-fleshed squid stained with black ink are a common sight at the market, where both squid and ink are valued ingredients and often used together. In other places, you can find squid ink bottled or packaged (like here). It's definitely less messy and makes this dish even simpler. It can sometimes be thicker than fresh ink, so it can be diluted a little with some water before adding to the pan. Essentially, this is a two-part recipe, where the squid is slowly braised in its own ink with wine, garlic, onion, and tomatoes until tender. This is the body of the dish, where all the flavor, color, and intrigue lie. The rice is then toasted and cooked very simply with onion and fish stock. Halfway through cooking, the braised squid is added to the rice, where the magic begins as the rice begins to absorb the jet-black ink. 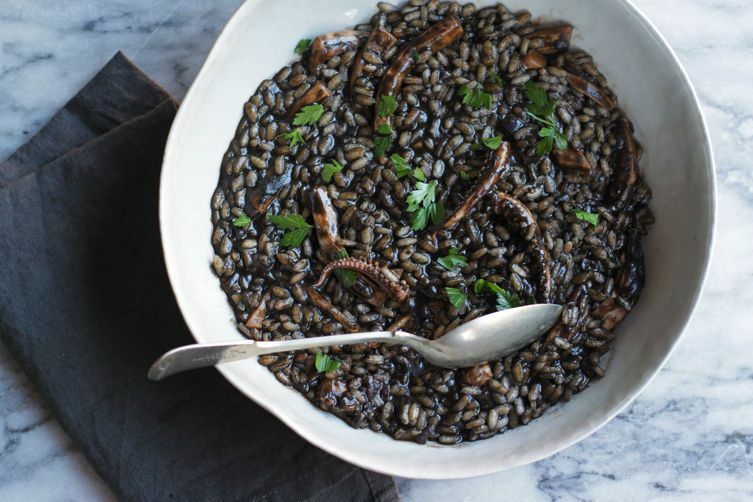 The squid and ink braise is also delicious as a sauce tossed with long pasta like linguine or spaghetti – and this becomes a traditional dish that will take you all the way to the opposite end of the country, to Sicily. A hint of fresh chile does not go astray in this case. Strictly no cheese should be served with this dish, but plenty of black pepper? Yes, please. Just one mention of this dish in a show called Monster made me search it out, just to see if it was some weird Japanese-Italian fusion cuisine. Now that I know it's a thing, I'd love to give it a shot, but I get the feeling you won't find this on the menu at an Olive Garden. Stunning dish! Definitely need to try this recipe to share with my friends.